"'Resurrected eyesore in Henrietta,' yeah, say that," Mike Infantino tells me. Infantino's Market Restaurant now occupies the former Friendly's on East Henrietta Road, which stood empty for a couple of years. It did surprisingly well on Mushroom Boulevard for nine years before the move --- "A dead-end street!" Infantino interjects, "And we had waiting lines! But the new spot is better." Mike Infantino describes himself as a guy from the 'hood, but explains, "God changed me unbelievable. I'm a legit guy in the restaurant business." Still, his family has been in the business for years. His parents, Mike and Bonnie, opened the Pillar Steak House and ran the Fan Party House. And his grandfather, Tom, ran the Platt Street Diner. Infantino's plays like one part Antoinetta's mixed with one part Coal Tower, with the slogan, "Italian-American Comfort Food." Homemade tripe and gnocchi live side by side with burgers, soups, salads, and standard diner breakfast offerings. Infantino's well-known greens and beans are delicious. Butter, garlic, lemon, and more butter sit proudly, not bitterly, and the escarole is wilted, not overcooked. A huge portion is $5.99 (add $1.50 for sausage). This seriously overshadowed a middling potato soup. But the soups are homemade, and sausage and lentil was much better. Lemon chicken, a baked, half-chicken, will appeal to the skin-and-bone lovers. The wing, thigh, and drumstick were delicious, and the crisp-tangy skin helped out the somewhat dry breast. For $7.99 with fair mashed potatoes and a good salad, it was a solid value. Linguine Alfredo was a highlight. The pasta was al dente, the sauce rich but not cloying, and large pieces of lightly-cooked mushrooms were a great touch. I wasn't as fond of the lasagna ($7.49), which featured hamburger rather than sausage. When asked, Infantino said, "Yeah, that'd probably be better." Mitzi Sliker makes all the desserts in-house. The bread pudding was good, but suffers from the benchmark problem: it isn't the Fishers Station bread pudding. Lemon crème pie was decent, as was the carrot cake, though it could have been more moist. The food was largely to my kids' liking. Breakfast is available all day on weekends, and Iris, my five-year-old, took advantage by getting two excellent, fluffy pancakes ($2.49). Fruit cups come with several of the "little folks" meals. My oldest was picky about the chicken fingers, but that was just her; they were as good as that silly food gets. My wife, Anne, tried a portabello mushroom sandwich ($5.99), which, in her words, "needed some zip." She put some honey-mustard dressing on and was happy. Echoing burgerologist Stan Merrell, Anne pronounced the fries "coated" with some disdain. Coated or not, they were crisp and plentiful. Infantino's Garbage Platter was delectable ($6.29). It comes with beans rather than mac salad, so I went with two Zweigle's white hots. Mike Infantino claims his grandfather's hot sauce recipe is 100 years old. Perhaps. It is a great hot sauce, though, meaty, aromatic, and very hot. He cooks his homefries crisp, which makes for a great bed, and with a ton of pepper, accentuating the hot sauce. Infantino's is an Italian restaurant in the sense that Mark's is a Greek restaurant: it's a diner with Italian-American food on the menu. So, there's eggplant parm ($7.29), linguine with marinara sauce ($5.29), and pasta fagioli ($6.59). I didn't find the sauce distinctive, but it's hard to tell people what they'll like in a tomato sauce. Loyal fans love it, so make up your own mind. Mike Infantino is proud of the "enjoyable, non-alcoholic atmosphere" he's created. ("Write that," he says again.) He complains about the belligerent volume of many of the big, family-oriented chains, and he's on the money there. His wife, Colleen, "controls the dining room," he says, and it's a tight ship. "I hate that word, 'tradition,'" Infantino says. "Jesus don't like that word either." Still, you see the good side of tradition at Infantino's: family recipes for greens and beans or hot sauce, and decades of experience in food service. But there is a power in continually creating what you are and will be anew, and I think that's what Mike Infantino means. He's proud of where he is right now and how, as he says, "God twisted me." And why not? 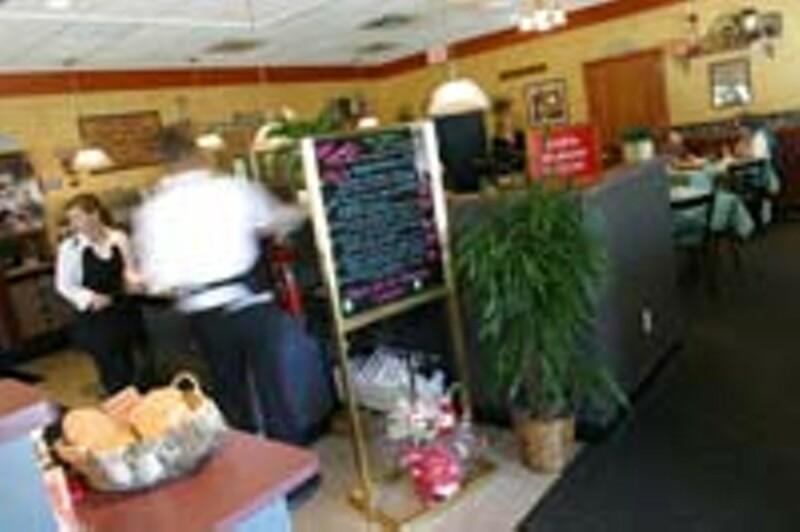 Infantino's Market Restaurant, 2133 East Henrietta Road, 359-0990. Hours: Sunday, 7 a.m. to 2 p.m.; Monday & Tuesday, 7 a.m. to 3 p.m.; Wednesday through Saturday, 7 a.m. to 8 p.m.
Shiki, a new Japanese restaurant, opened two weeks ago in the old Golden Port location, 1054 South Clinton (Golden Port is now at 105 East Avenue). Shiki serves sushi and a wide range of appetizers, noodles, teriyaki, and tempura for lunch Monday through Friday, and dinner Monday through Saturday. 271-2090. Michael Warren Thomas can be heard weekends on WYSL 1040 AM. Tune in on Saturdays for gardening, restaurants, and Finger Lakes travel from 9 a.m. to noon. Visit www.SavorLife.com to see photos of Shiki and its menu.